‘Tis the season for apple picking, pick-your-own pumpkins, corn maze wandering, and fall festivals. And where better to do any of those things than at a farm or orchard in Virginia’s Blue Ridge? Pile in the family wagon and plan a foliage-filled day around all things farm related. Such outings are not only perfect for making family memories, but for adding a little more glue to the bonds of friendship. 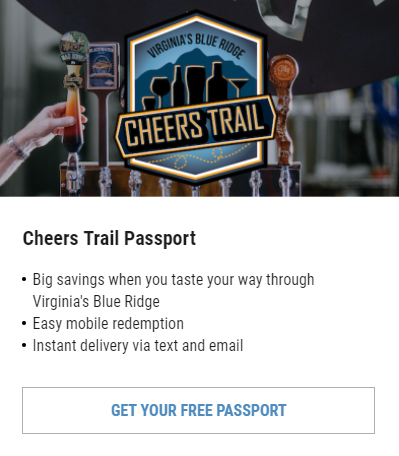 Gather your pals and hit a winery or craft brewery along the way. If it’s fall in Virginia, it’s time to be at Jeter Farm in Buchanan. Their month-long fall festival includes hay rides, corn maze, barnyard, pumpkins, fun slides, and great food. The festival is open weekdays for school groups and Friday through Sunday for the rest of us. Taste the apple cider, snag a bag of kettle corn, and plan to make a day of it. Nearly 90 acres make up Layman Family Farms, and much like Jeter Farm, they are a popular destination in the fall. Their autumn weekends (mid-September through mid-November) include hay rides, a corn maze, pumpkin patch and maze, farm animals, swings, giant tractor tires, corn hole, a bird house village, a BeeLine zip line, corn cannon, pumpkin blaster, and cow train. Group rates are available for parties of 15 or more. 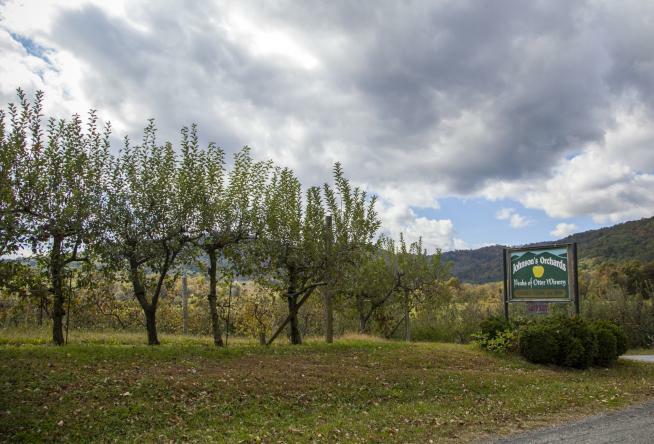 The wines crafted at Peaks of Otter Winery are done so using fruit from their orchard as well as their vineyard. Open daily, you’ll find it a picturesque place to not only taste their wine to find your favorite, but also to relax and enjoy the views and fall foliage. Plan to visit October 20 for their Shelter Fun Frolic event, a dog-friendly fundraiser for the Bedford County Animal Shelter. While there are not pumpkins or apples to pick at Chantilly Farm, it’s a beautiful place to camp in a tent or RV, and there is a Halloween Spooktacular on October 25. The public is welcome to dress up for the costume contest and enjoy this free event. Special performances, snacks, beverages, games, and more are in store. Friday’s through October are Sanctuary Open Day and Pollinator Plant Sale at Spikenard Farm. These days offer an interesting, up-close encounter with beekeeping and the chance to secure your own pollinators to draw bees into your garden. 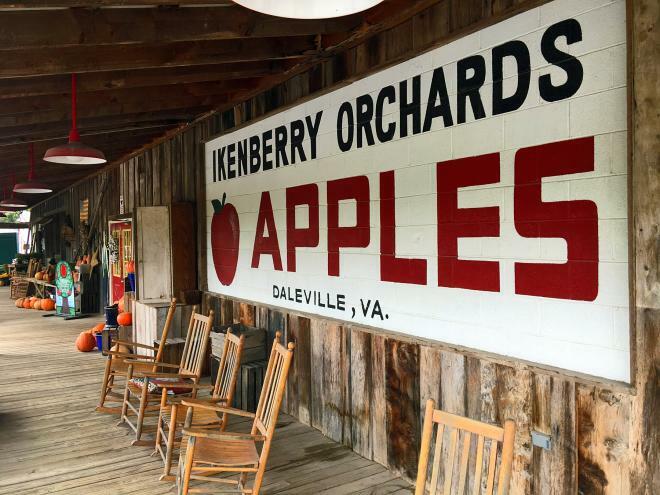 • Ikenberry Orchards & Country Store in Daleville is a five generation family-owned endeavor. Their Botetourt County farm yields a variety of apples and peaches (now out of season). Their country store is a top destination for those seeking country butter and ham, bacon, beans, pickled goods, eggs, honey, cider, jams and jellies, and fresh baked goods. • Homestead Creamery in Wirtz is a dairy farm with some of the best milk and ice cream you’ll ever taste – 15 and 22 flavors, respectively. Their farm market serves delicious sandwiches (not your typical ham and cheese … unless you’re a kid or it’s what you want, of course), paninis, and salads. Make a beeline for the market this fall to get eggnog or pumpkin ice cream. • Martin Farms is located in Fincastle but is more readily available at the Historic Roanoke City Market. At the market you’ll find whatever is fresh from the farm, including meats and cheeses, pumpkins, winter squash, and apples. At the farm in October (Wednesday through Saturday), you’ll be welcome to shop for the same, as well as possibly see apple butter making and milk processing. • The farmers markets in Virginia&apos;s Blue Ridge feature an abundance of all your favorite fall produce and baked goods. 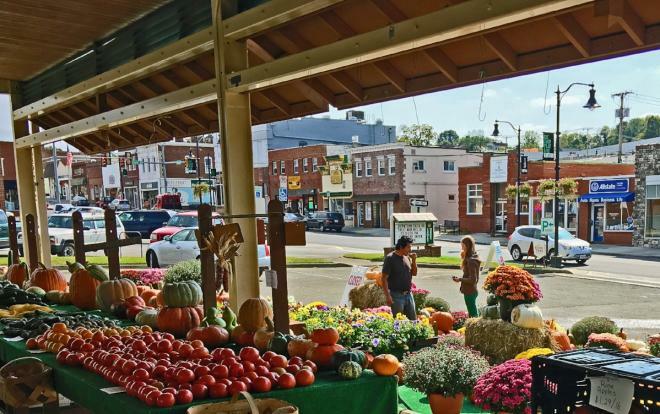 There are local markets throughout the region and it&apos;s a great way to spend a Saturday getting to know the authentic stories and flavors of the area. Visit our Farmers Markets page for a complete list of markets to check out. 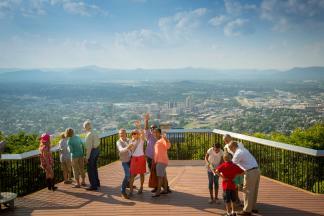 As you venture around this fall enjoying a #BlueRidgeDay, we hope you’ll share those experiences socially. Connect with us on Instagram, Facebook, or Twitter to let us know what the farms are like, how hard the corn mazes are, or which fall treat was your favorite.